If you are looking for curb appeal for your property, landscaping is the one thing that will bring it to life, and landscape edging is the pièce de résistance or finishing touch that can pull it all together for the front, back or garden area of a home. Whether you are enhancing or updating the look of your home’s exterior or getting ready to place your home on the market, landscape edging can give you the “edge” either way. There are a number of different options for edging use. Knowing and understanding styles that will coordinate with your home as well as plants that are best suited for the environment of your property are all important considerations. With the availability of various edging materials in the marketplace today, it’s a good idea to check them out to determine what is workable and practical for your outside area, your individual style, creative sense and your budget. Any decisions made about landscape edging will likely be based on those factors, and the additional information that follows should give you a better idea of what can work for your situation and your home. Landscape edging comes in a range of material combinations and choices that include: brick, pavers, concrete, cinder blocks, stone, glass, metal, ceramic plates, wood, tiles, pottery, treated railroad ties, wire mesh panels (gabions), and various other materials that have either been recycled or repurposed. – Terra cotta clay pots, split or used whole, can be turned on their sides and placed along an area to be edged. They are a relatively inexpensive way to make attractive edging for areas where other larger clay pots or planters are being situated. – Cinder blocks are another less costly way to edge an area, particularly for a space against a house that requires a rectangular formation and double planting. Anyone heavily into gardening knows that they can use the middle portions of the blocks to add other plantings, like flowers or smaller plants, while the area behind the blocks is protected and can house other plants. – Malleable and aged metal is an edging that can be used for elevated or raised bed areas for plantings, and it is the type of edging that can be fairly inexpensive when it is found through recycling centers, second hand material community associations and other places that offer metal edging materials at discounted prices. – One inexpensive approach to landscape edging is recycled glass bottles. They’re definitely on the inexpensive, literally free, side and they can make an attractive, colorful, durable and whimsical addition to the edges of any area where larger plantings are placed. The bottles can be buried long the section to be edged, plus they will likely outlast the shrubs, plants and anything else placed behind them because of their lasting quality. – A gabion barrier or wall is a natural fence edging that might be unfamiliar to some, but it is another attractive and fairly easy way to create a barrier through wire basket structure. 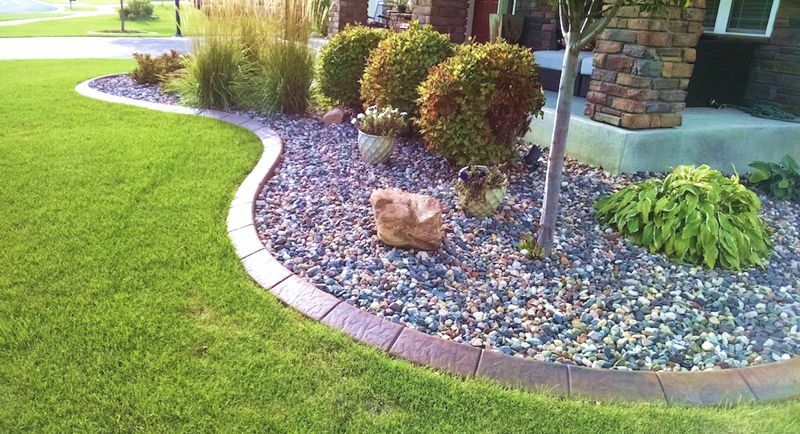 The edging is stable and can be combined with other materials and filled with colorful river rocks, wood, concrete pieces, stones, or other materials. A gabion has a base that is not easily eroded or shifted, and they are not only protective but environmentally friendly. – Japanese forestgrass flourishes in the shade and produces mounds of foliage and makes a wonderful accent along landscape edging. – Sedum is a clumping plant that adds a neat and clean edge for larger plants. Sedum is hearty and holds up well in heat and during dry periods. – Alyssum is a flowering plant (annual) that produces beautifully fragrant white, pink, lavender and cream flower varieties and if cared for properly, it should bloom on a continuing basis throughout a growing season. 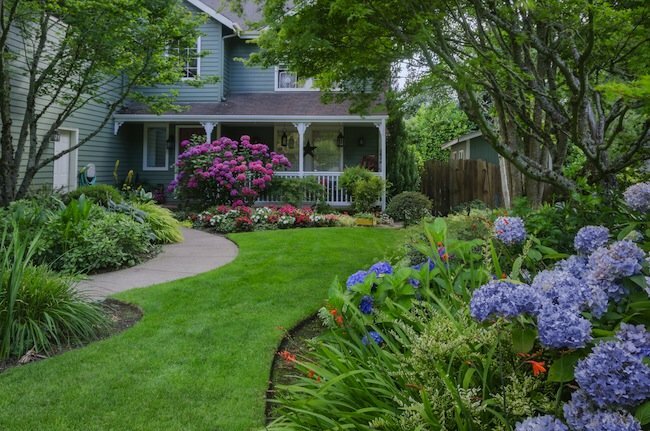 With the endless landscape edging ideas and robust plantings available to lawn and garden enthusiasts, almost anyone can find something that will coordinate with their front or backyard that suits their tastes and pocketbook. Whether you are edging a vegetable, herb, or flower garden as well as large shrubs, or areas with individual planters, there are both practical and inexpensive types of edging available that are either, new, used or recycled that can give you the edge when it comes to your exterior landscaping needs.